Didn’t get a chance to make it to the Pop Up Grocer in New York? We’ll bring you up to speed fast. We saw plant-based foods multiplying in every category - even a sweet potato-based honey alternative! Sea vegetables were well-represented in snacking, particularly in the booming category of alt-jerky. More and more snacks are sneaking a dose of vegetable in with their fruits, and indulgences of all kinds are getting a healthy boost - from ice pops with probiotics to athlete-focused fudge. CBD is in snacks and drinks, but it’s also going ever-more upscale, with beautifully packaged truffles. Protein is coming from new sources, and in new forms - we saw poppable cricket snacks, DIY nut milk mixes, and portable hard-boiled-egg kits. Finally, Asian flavors and ingredients were well-represented: ultra-chic sichuan sauce, ghee in many forms (including chocolate spread!) and refrigerated, pre-made Indian meals. Click through our slideshow to check them all out! Escapism has become an art form. As we search for ever-more engrossing ways to forget the troubles of the real world, new forms of media are emerging to help us live out our dreams. Speaking in the vernacular of video games and powered by an array of new technologies, these mixed-media entertainments offer a thrilling escape from the world we know. Consumers are eager to jump down the rabbit hole - here's where we think they're going. Where did it start? It's hard to say, but July 2016 seems like a good place to plant the flag. Two key things happened that month: the release of Stranger Things, which catapulted the grandfather of immersive games - Dungeons & Dragons - into mainstream popularity; and the launch of Pokemon Go, an augmented-reality game that brought a digital world to suburban backyards and city streets. In the years since, we've seen a boom in immersive experiences that merge reality and imagination; the Oculus Rift drove a revived interest in VR and made it, if not a runaway hit, a fixture in the popular consciousness. Tabletop gaming has seen an enormous revival, with friends gathering to slay imaginary orcs and write their own epics. Instead of becoming a pop-culture footnote, Pokemon Go continues to grow. And a new wave of games like Fortnite remove the anonymity of online gaming as real-life friends form squads online to battle for supremacy. 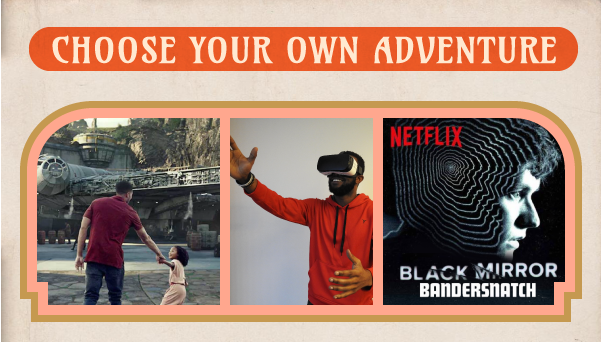 2019 is already looking like a banner year for immersive fantasy. Netflix's choose-your-own-adventure Bandersnatch movie was a runaway hit, seamlessly merging television and gaming, and their Russian Doll series brought a video game twist to the Groundhog Day trope. The best hope for a true VR turning point will arrive later this year, too, with the release of the Oculus Quest, a self-contained VR headset that's more game console than PC accessory. The most radical form of escape, however, will arrive this summer and fall, when Disney opens its Star Wars-themed Galaxy's Edge parks in Anaheim and Orlando. Disney's parks have always set a high bar for self-contained experiences, but their Star Wars worlds will present an uncanny, Westworld-like degree of total immersion. Instead of being Star Wars-themed, the parks simply exist within the Star Wars universe. The designers have been careful to make this distinction clear, and it is rumored that concession stands may not even sell recognizably branded products, lest the glimpse of a logo breaks the illusion of being in a galaxy far, far away. Visitors stay in a hotel that resembles a spaceship, adopt a new identity, and complete quests and tasks that follow the internal schedule of a world filled with actors. We can only imagine that aging Star Wars fans must already making plans to retire there. At times when reality is stressful and feels out of our control, we've always be drawn to escapism. Two things make this particular moment different: Emerging technologies allow us to overlay these adventures on the real world, or escape the real world entirely. And today, 36 years after the release of the first Nintendo Entertainment System, the underlying logic of video games - of quests, power-ups, temporary death and instant rebirth - has become a shared understanding in the mainstream. Generations raised on games are remaking their own realities - and they're building them with a gamer's sensibility. Hidden beneath Michelin-starred restaurant Atera, in the kind of space where you might expect to find an after hours dance party, is something even more exclusive - a thriving farm. 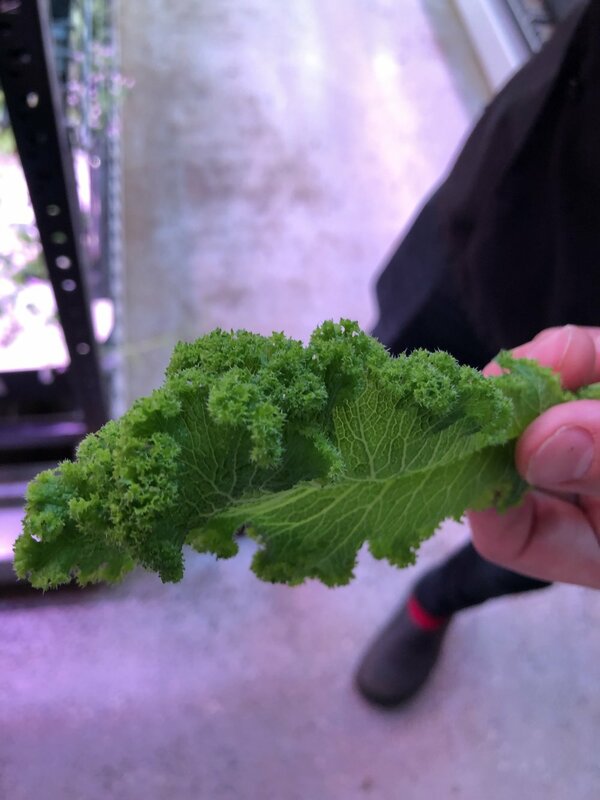 Our team recently paid a visit to Farm.One, a tech-driven, flavor-forward vertical farm buried in the middle of Tribeca. 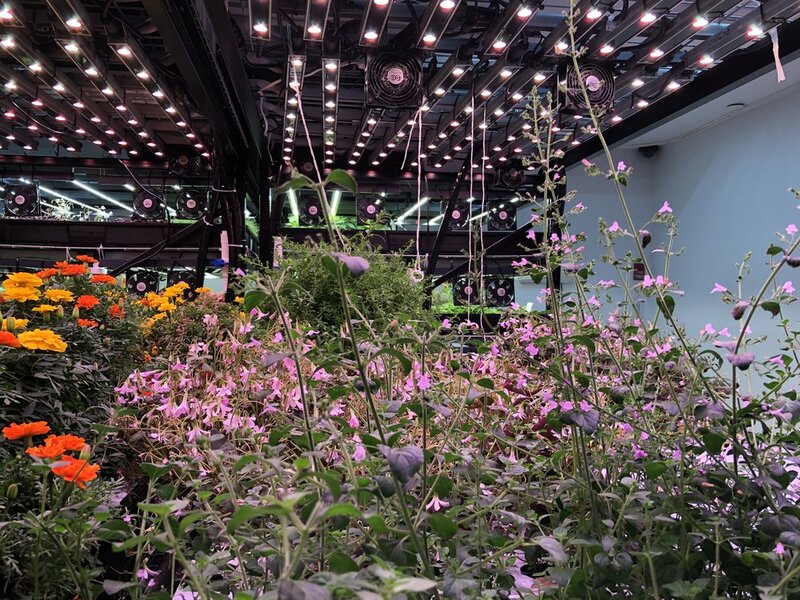 In this subterranean laboratory, an entirely new kind of farming is emerging – it's hyper-local, hyper-efficient and hydroponic, but if you think this is just about eco-consciousness, you're missing the point. The engineers at Farm.One started with a clean slate, completely rethinking every aspect of the growing process. They designed their own hardware - a system of compact racks that stack plants in layers, with a growing medium made from coconuts - and their own software, which is tailored not just to specific varieties, but to clients' exact specifications for each plant. 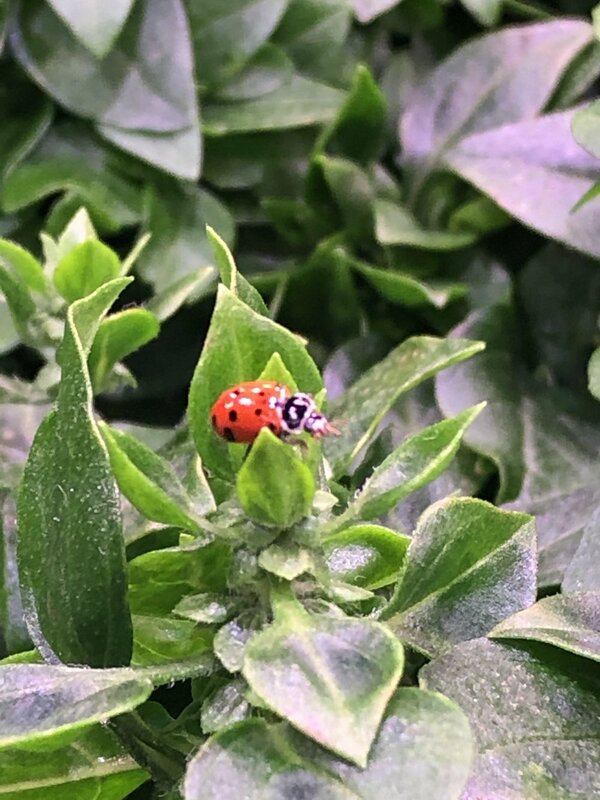 Looking for edible Dianthus flowers with a bud size between 25 and 35 millimeters? Their system can churn them out with remarkable consistency. Farm.One has found an enviable niche here in NYC: instead of competing with conventional farming, they have doubled down on specialty offerings. A proprietary nutrient mix gives their produce the depth of flavor and sensorial experiences that are often missing from conventional hydroponic vegetables, and an emphasis on rare varieties of difficult-to-grow microgreens and edible flowers gives their clients' dishes exclusivity and beauty. It may be a while before any of us are buying our conventional vegetables from urban farms like Farm.One. 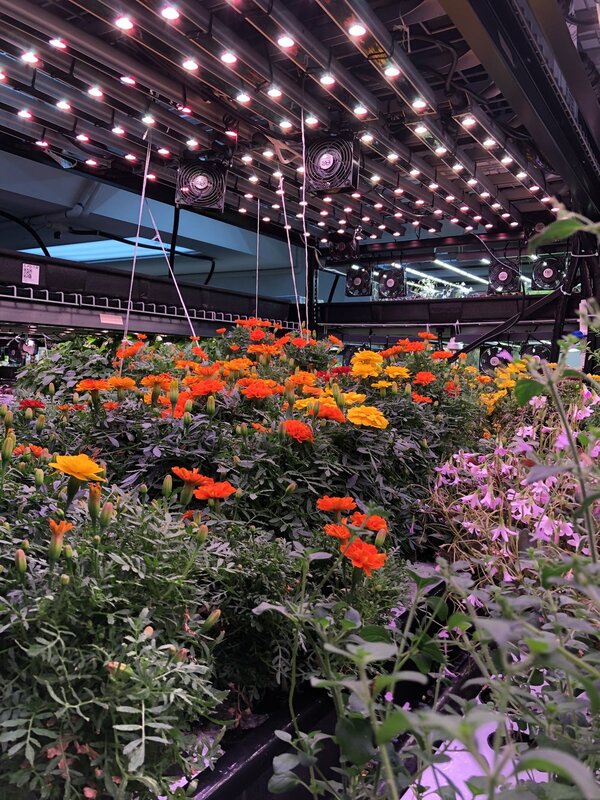 But in the meantime, beneath our city, in a climate-controlled chamber where seasonality has no meaning, trays of exotic produce earmarked for Eleven Madison Park and Marea are hinting at the future of agriculture and flavor. As 2018 draws to a close, we can't help but think about the big picture. From flooding to wildfires, deforestation to loss of potable water, this was a year in which concerns about the environment that had seemed distant and abstract not so long ago became a tangible presence in our lives. But there are reasons to be hopeful, and they were on display when we visited this year's cutting-edge Food Loves Tech conference in Brooklyn’s Industry City. It’s a conference where small, cutting-edge brands with a foot in the worlds of food and technology come together to show off their own visions of the future. This year, we felt a true sea change in the tone and focus of the products being presented. What we saw were solutions for a rapidly urbanizing world where the environment and sustainability are primary concerns - but, at the same time, where the environment can't necessarily be depended on as a resource. It’s heartening to see that there are young, creative entrepreneurs dedicating their time and energy to tackling these challenges, and we think there is something all of us could learn in their resourcefulness and idealism. We here at Consumer Eyes wish you a happy, safe holiday season and a boundlessly creative 2019! Farmshelf is building self-contained indoor hydroponic farms, turning food miles into food feet. What’s it like launching a snack brand based in an ethnic food culture your customers have likely never encountered? We recently had an opportunity to sit down with Anshu Dua, founder of The Chaat Company. His New York-based brand is launching a new line of Indian street-food-inspired snacks, bringing the flavors of Indian chaat culture to the American snack aisle. We talked about the challenges of starting a new brand, when and why to pivot, overcoming entrenched ethnic food clichés, and how Americans’ openness to new food experiences is transforming the food landscape. With the advent of Alexa and Siri, we've gotten more comfortable with the idea of talking with artificial intelligence software. But in those interactions, the AI tends to be standing in for something inanimate - a toaster, a kitchen timer, maybe a light switch. A couple of recent announcements, however, suggest that this relationship is about to get a lot more complicated. 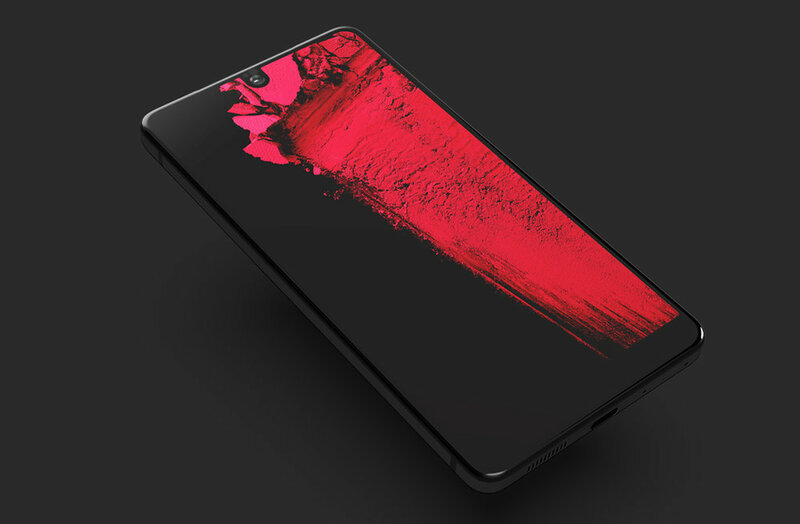 Essential Products, a smartphone manufacturer started by Andy Rubin, creator of the Android OS, has announced the development of a new phone that will take on many of its users' social responsibilities. It will automatically respond to texts and emails, and can take care of scheduling tasks without any outside input. Because of its focus on autonomy, it will also look less like a conventional smartphone, with a smaller screen and an emphasis on control via voice; both of these developments line up with some predictions we made late last year. At the same time, Google has announced that by the end of the year, its Duplex voice assistant software will be available on its Pixel smartphones. You may remember Duplex from its slightly creepy demo back in May, where the next-gen assistant made a hair salon appointment over the phone. Complete with "um" and "ah" pauses, it completed its task without the human on the other end realizing they had been talking with a ‘bot. If you use Gmail, you may have already had a glimpse into the strangeness of this future. Google Smart Compose launched earlier this year, giving users suggestions for how to reply to emails - "Ok, sounds great!" or "Let me check on that" - and it is continuing to enhance its ability to auto-complete common phrases or introductions. While this sounds initially very convenient, we anticipate some serious concerns emerging about just who we really are when we use these systems. Did your boss's email really "sound great" or was that just the closest approximation of what you really would have said? How polite do we need to be when we answer the phone, knowing the caller on the other end is most likely a 'bot - even if it's calling on behalf of Grandma? Did you really want to go skydiving, or did your phone just see that you had some free time this weekend and made a few calls? We expect to see questions of trust and honesty emerging alongside these technologies, with consumers pushing for new ways to understand and experience true human connections and know that their decisions - and their personalities - are truly their own. Didn't have time to make it to this year's Summer Fancy Food Show? We've got you covered. We did the legwork, talked to vendors from around the world and sampled amazing new foods, drinks and ingredients in a search for the trends we will be seeing in 2019 and beyond - and we managed to squeeze it all into just two minutes. In 2014, the idea that in just a few short years we would all be talking to intelligent virtual assistants in our homes may have seemed impossibly optimistic. But a confluence of impressive technology, deft marketing and perhaps a little zeitgeist-bump from Spike Jonze's film Her came together to make a sci-fi fantasy into reality faster than anyone could have anticipated. And this year, it's starting to feel like we've arrived at a similar pivotal moment in robotics. Long relegated to assembly lines, the last few years have seen increasingly capable droids taking over distribution warehouses, stocking store shelves and flying overhead. Even recent stumbles - a series of highly publicized self-driving car accidents, and Tesla's decision to swap out some automated manufacturing systems for old-fashioned human operators - feel more like corrections on the path to greater automation than a change of course. The next wave of robots are promising incredible dexterity, emotive personalities and, most importantly, the support of some major consumer tech ecosystems. And instead of lurking in factory shadows, they'll be in our homes, cooking our food and taking our selfies. Marijuana is having its cultural moment in the sun. Legalization campaigns are finding success around the US, and a new generation of entrepreneurs, chefs and designers are reexamining every aspect of the marijuana experience, transforming a once-illicit practice into a stylish - and socially acceptable - lifestyle. Significant credit for this push should be given to CBD oil. CBD is a hemp extract that lacks THC (the chemical compound in cannabis that gets users "high") but is believed to hold a nebulous range of benefits centered largely around reducing stress and inflammation. Though the jury is still out on its efficacy, CBD has been popping up everywhere, helping to put forward an image of marijuana as a mainstream supplement. Our intrepid testers, Penn and Dave, decided to see if a little CBD would enhance their workday - check out our video to see how the test went. Amazon's first Amazon Go store opened on the 22nd, and the high-tech checkout-free grocery concept hasn't really left the news cycle since. Journalists and YouTubers have shoplifted, with varying degrees of success; a community petition has circulated to make the store accept SNAP foodstamp benefits, and alarms have been raised about the threat it poses to existing retail jobs. The hype surrounding Amazon Go has been so powerful, in fact, that you could be forgiven for missing some quieter - but equally high-tech - moves Amazon has been making toward sewing up the entire food experience. At CES, gadget maker Ovie revealed SmarterWare, a smart food storage system that syncs with Alexa. Simply say what you're putting in each container, and toss them in the fridge. The virtual assistant will determine each item's time until spoilage and alert you when your leftovers start to get a little dodgy. Alexa has also been given the ability to control select microwaves, with Whirlpool the first to integrate the expanded API into their devices. She can even listen to a description of what you're cooking and determine the correct preset. A conventional oven is on the way, too, but we're just looking forward to hearing a voice tell us our food is ready and finally bid adieu to the five beeps. Amazon's plan for retail dominance extends beyond its own Go and Whole Foods stores, too - a pilot program here in New York has placed Echo devices inside the Bottle Rocket Wines and Spirits store to allow shoppers to consult Alexa before buying a bottle of whiskey. The assistant has been set up to only reference items available in-store, and uses a custom "Bottle Genius" skill set to make sure customers leave with the perfect single malt. Amazon has shown an incredible ability to make a niche for itself in every aspect of consumers' lives. It will take time for the Amazon Go concept to expand significantly, but by leveraging Alexa, Amazon is rapidly laying down the beginnings of an infrastructure - and an accompanying lifestyle - that will make sure consumers stay within their ecosystem right up to the first bite. Waking up in New York City on cold winter mornings is a real challenge. The sun is barely up and even when it is, the tall building next to mine blocks out most of the early rays. I was determined to make this winter different. I purchased a Philips Wake-Up Light and as soon as it was delivered, I was able to set it up in under 15 minutes. I performed a few test wake-ups over a weekend to be sure I had chosen the best settings for me and when the following Monday morning arrived, I woke up feeling refreshed, calm and well-rested. Now, I normally wake up long before the alarm's light slowly fades in, ready to start my day. My neighbors probably like me a little better since they don't have to hear my snooze go off every 10 minutes through the paper-thin apartment walls, and I no longer have to cycle through all the various alarm sounds on my smartphone, trying to find a "less irritating" sound. For anyone who has had the pleasure of waking up to the sun, this alarm clock is the closest thing you'll get outside of a beach holiday or living in California. It's the best alarm clock I've ever had, and one that I've already recommended to many friends who, like me, have trouble getting out of bed. And if that's not you as well, then please tell me your secret. Ah, the Holidays! All year we look forward to gathering together with our extended families, catching up with distant relatives and getting reacquainted with our roots. And just as quickly, we do whatever we can to retreat to the safety of the TV. This year, we thought we'd put together a recommended watchlist that will help you use that me-time to see some great shows and maybe even learn something too. Just try to give family time a chance before opening up Netflix, OK? This beautifully-produced series of one-off profiles looks at designers in every corner of the field, and never ceases to inspire. You'll finish the series with a newfound appreciation for the objects around you, and maybe even some new creative tools in your toolbox. With beautiful cinematography, Michael Pollan explores cooking traditions around the world and the power they have to shape who we are. Is there anything more beautiful than a steak being seared in slow motion? This one's a little dark, but we don't think a show exists that has been more prescient about how technology is changing - and challenging - our society, though Mr. Robot would have to be a close runner-up. Only for those of strong constitution. Netflix Japan produced some of the most original series of 2017, and this is one of our favorites. When an introverted retiree impulsively orders a beer with lunch, his "inner samurai" is released, and he begins a journey of self-discovery by exploring the restaurants of his home town. If you find Broad City's humor a little, well, broad, consider checking out this more nuanced black comedy, a sort of Millennial take on Scooby Doo that stars Alia Shawkat of Arrested Development. This ersatz-anime is a cultural and stylistic melting pot: created by Ezra Koenig of indie pop band Vampire Weekend, it was animated in Korea, stars Jaden Smith and Tavi Gevinson (with Susan Sarandon and Steve Buscemi in supporting roles) and is packed with Gen Z ennui and clever New York City references. In each episode, the wonderfully dry Richard Ayoade (The IT Crowd) and a celebrity guest spend 48 hours in a new city, attempting and sometimes even succeeding to fit in with the locals. We've all been there. In a year where our nation felt more divided than ever, Sarah Silverman travels across the country on a mission of empathy, looking to find the common threads that tie us together. Roughly structured as a talk show, this is still highly experimental TV, and when it pays off it's great. Director Guillermo del Toro's Pan's Labyrinth is a favorite in our office, and his latest creation is a return to form. Riffing on The Creature From the Black Lagoon, del Toro cleverly explodes the monster genre to create something with more soul than scares. If you need an excuse to get out of the house, this is it. Sean Baker's visually striking film about life below the poverty line in Florida is never condescending; it portrays its characters with empathy, compassion and humor. It's a little disorienting to see a film set historically in 2003, but Greta Gerwig's directorial debut is a powerful coming-of-age story and, based on Rotten Tomatoes rankings, "the best-reviewed film of all time." We think it's well-deserved. This Joaquin Phoenix-produced documentary became the Food Inc. of 2017, turning a critical eye toward the meat industry and some of the world's leading health organizations. Though it has since seen some backlash, it's still crucial viewing to understand the motivations of today's leading-edge consumers. Anyone who loves food can appreciate Les Blank's 1980 documentary, an ode to garlic across cultures. Seen today, it's a perfect time capsule of an era before food blogs, Instagram and celebrity chefs (though Alice Waters and Chez Panisse make a welcome appearance), and it may just inspire you to turn off the TV and spend a little more time around the kitchen table with your family. This episode of EconTalk features wonderfully irreverent Food Channel star Alex Guarnaschelli speaking candidly about the realities of opening and running a restaurant. Eye-opening listening for those of us who enjoy eating out. Happy watching (and socializing) from everyone here at CE. We wish you an inspiring, safe, creative new year! Today, it's easy to think of Google's circa-2013 experimental wearable as a technological dead-end. The web is full of think-pieces describing Glass as a solution in search of a problem, a project driven more by engineering and its designers' love of sci-fi than by consumer insight or marketplace research. But with the launch of the iPhone X, we think the nerdy headset is ripe for a reappraisal. As you watched the big iPhone X reveal, did you note a phantom ache in your forearms? With each augmented reality app announcement, the X looked a little heavier, a little more awkward to hold at eye level. It's amazing to be able to watch a baseball game while the iPhone overlays player names and stats in real time, but how long can you really hold your phone up in your line of sight? How many rounds of a virtual tabletop strategy game can you play before you'll wish you could just put the phone down for a second without breaking the illusion? "All the intelligent parts of human production go with the strategy of dematerialization — less and less and less materiality, more and more and more intelligence. The computer was a very good example, and now the telephone is a fantastic example. That’s because in a telephone, only the image and the sound is important. And yes, we work to have less and less and less and less. ...That’s why we are really, with the telephone, in front of the end of dematerialization." This philosophy appears to be on Apple's mind, with their continued development of the Apple Watch. Building in more sensors while also enhancing its autonomy, they seem close to cutting the Watch's link to the iPhone completely. And in the home and car, virtual assistants from every major technology player can perform many of a phone's functions without any display at all. Siri or an Apple Watch will never fully replace the iPhone, though, because at the core of the device's appeal is its camera. A next-generation device will still need to see, and to relay that vision - filtered through AR - to its user, and thus a Glass-style headset starts to look less like a novelty and more like an inevitability. Glass never really died, of course; earlier this summer, Google announced the launch of an Enterprise Edition model, which focuses on enhancing workers' productivity. And Microsoft's Hololens is a similar device with far more impressive visual specs, overlaying 3D AR imagery over the wearer's field of view. Thus it seems as though Apple is playing the long game; riding the success of the iPhone, they can afford to let Google take all of the lumps for launching an odd, polarizing first-generation device, while waiting for consumers to become more comfortable with the concept of augmented reality. And when iPhone fans' arms finally get tired, we have to assume Apple will be ready with another big reveal. Is Film the New Vinyl? Everything analog is cool again. The revival started with vinyl records, and in the past couple years we've seen it expand to encompass VHS and even cassette tapes. But perhaps the biggest analog format of all - film photography - has taken longer to build momentum. In the last year, though, interest has been increasing dramatically, and manufacturers are taking notice. New York has emerged as an epicenter of the new film photo scene, and we recently sat down with two of the movement's biggest figures - Kyle Depew of Brooklyn Film Camera and Geoff Berliner of the Penumbra Foundation - to learn more about why young people are snapping up vintage cameras, reviving once-defunct film brands and diving back into the darkroom. Chapulines, or fried grasshoppers (also sometimes called crickets), are a popular snack in Mexico. But they can be a little tough to find here in NYC - so when we heard that La Newyorkina was offering a limited-edition ice cream with the little guys on top, we had to jump at the chance to give it a try. New York's Summer Fancy Food Show is the largest specialty food event in North America, where vendors from around the world come to show off their latest creations. Increasingly, the show floor feels divided into two separate worlds: booths representing old-guard, traditional "gourmet" products in the European tradition sit next to booths manned by hip creatives bringing fringe food trends into the mainstream. We scoured the show floor for the most interesting leading-edge products, and talked with creative, enthusiastic young entrepreneurs exploring new ingredients and bringing innovation, functional enhancements and new benefits to the marketplace. With the news today that Amazon would be purchasing Whole Foods in a deal valued at $13.7 billion, the online retailer has made a clear commitment to physical retail. Amazon has experimented with grocery store concepts in the past; we reported on their checkout-free Amazon Go concept store late last year. But more importantly, Amazon now has a brick-and-mortar foothold in valuable locations around the country where well-heeled, tech-savvy Millennials and Gen Xers are raising families and shopping for all kinds of items - not just organic groceries. Amazon was also recently granted a patent for software that prevents in-store shoppers from comparing prices online, suggesting that their commitment to physical stores is strong enough that they are willing to put time and energy into stemming the showrooming trend that has plagued other retailers. Amazon maintains that, for now, Whole Foods will retain its current branding and identity. And with Whole Foods' trusted brand and name recognition, this sounds like a savvy short-term move. Amazon's greatest strengths are in back-end software, logistics and distribution, and these could be used to improve the stores' performance behind the scenes while also turning them into distribution points for the existing Amazon Fresh online grocery service. With this acquisition it seems certain that Amazon is going to become a much bigger part of its more affluent customers' lives in the coming years. It's a massive phenomenon in Taiwan, Malaysia and China, but cheese tea is only beginning to gain notice here in the US. Click through to watch as our intrepid testers, Penn and Dave, pay a visit to Happy Lemon in Flushing, Queens and get a taste of what might be 2018's hottest drink.